AMOS is short for Analysis of MOment Structures. It implements the general approach to data analysis known as structural equation modeling (SEM), also known as analysis of covariance structures, or causal modeling. This approach includes, as special cases, many well-known conventional techniques, including the general linear model and common factor analysis (Arbuckle, 2005). Amos owned by IBM, is powerful structural equation modeling software that enables you to support your research and theories by extending standard multivariate analysis methods, including regression, factor analysis, correlation, and analysis of variance. With SPSS Amos you can build attitudinal and behavioral models that reflect complex relationships more accurately than with standard multivariate statistics techniques. Structural equation modeling (SEM) is growing its importance in field like social sciences, behavioral sciences and psychology. SEM can be used for estimation and hypothesis testing problems. Amos integrates a graphical interface with an advanced computing engine for SEM. The publication-quality of research paper improves due to use of the SEM. AMOS is an added SPSS module, can be purchased as standalone software, and is specially used for Structural Equation Modeling, path analysis, and confirmatory factor analysis. Amos uses GUI and builds models that more realistically reflect complex relationships because any numeric variable, whether observed or latent can be used to predict any other numeric variable. When you conduct research, you’re probably already using factor and regression analyses in your work. Structural equation modeling (path analysis) can help you gain additional insight into causal models and explore the interaction effects and pathways between variables. SEM lets you more rigorously test whether your data supports your hypothesis. 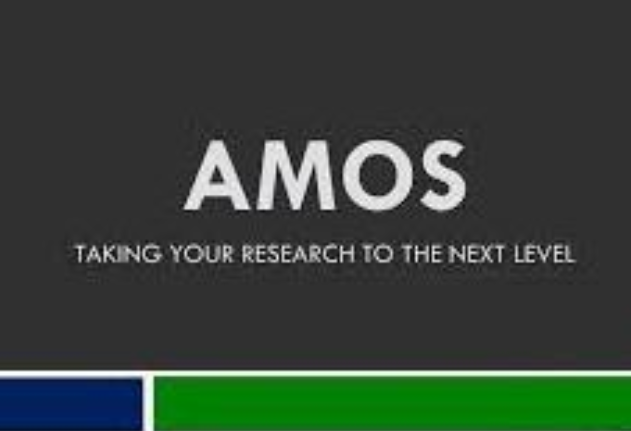 Amos is used for testing the model fit and linear relationships among large number of variables, it is also used for validating the questionnaire, SEM technique is popular amongst researcher, by using Amos you can prepare complex models, can test those with model fit indices. Amos is precise, it can be used for perfect decision making in complex business environment. With SPSS Amos, you can specify, estimate, assess, and present your model in an intuitive interface. SPSS Amos also offers a non-graphical method to specify models. SPSS Amos is the perfect tool for a variety of purposes, to be used in Psychology, Medical and healthcare research, Social sciences, Educational research, Market research, Institutional research and Business planning.